WAIST HIGH: Happy 25th Birthday The Crossing. Happy 25th Birthday The Crossing. Here's a big-noise guitar band from Britain that blows the knobs off all the synth-pop diddlers and fake-funk frauds who are cluttering up the charts these days. Big Country mops up the fops with an air-raid guitar sound that's unlike anything else around, anywhere, and if their debut album promises more than the four musicians can quite deliver at this stage in their young career, what it does deliver - especially on the Top Ten U.K. hit "Fields of Fire," one of the great, resounding anthems of this or any other year - is sufficiently scintillating to preclude any extended critical carps about the group's occasional lack of focus. At this point, the big picture is clear enough. 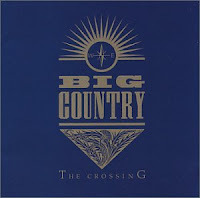 Like U2, Big Country has no use for synthesizers, and their extraordinary twin-guitar sound should make The Crossing a must-own item for rock die-hards. Generally dispensing with power chords, the group's two lead guitarists, Scotsmen Stuart Adamson and Bruce Watson, whip up skirling, bagpipelike single-string riffs that, on such crackling tracks as "Fields of Fire," "In a Big Country," and the grandly martial "Harvest Home," are a nonstop, spine-tingling delight. The slightly out-of-kilter guitar lines intertwine into a trebly alarm that has all the galvanic urgency of an ambulance careening down a darkened city street - it's really something to hear. Stuart Adamson would have been 50 on Apr. 11.